This article has been seen 21460 times. INGREDIENTS: 100% natural, wild harvested Siberian Cedar resin. 100% natural, wild harvested Siberian Bilberry flour. No preservatives, 100% Natural Chewing Gum. Directions: Warm up the product in the mouth for 5-8 seconds. Chew for 15-20 minutes after meals or whenever you want to. Safe if used frequently. The inhabitants of Siberia believe that Cedar Resin (Pine Resin) with Bilberry has great healing power, and has rightfully been called zhivitsa - related to zhizn, the Russian word for life - for its ability to heal wounds. The inhabitants of Siberia and the Urals long ago discovered the therapeutic anesthetizing properties of this resin. There is information that, as far back as 1638, the governor of the Tobolsk region, "pursuant to an official deed," assigned the tasks of gathering, simultaneously with St. John's wort, cedar resin for use "in wounds and in bruises." The successful use by folk medicine in the past of cedar resin for therapeutic purposes for snake bites and for the healing of wounds was reported by V. M. Florinskiy (1880). At the present, scientists have established that cedar resin in fact possesses bactericidal and balsamic properties. It is less inclined to drying out in comparison with pine resin, and is less subject to crystallization. It has been established that Cedar Resin (Pine Resin) has a great therapeutic effect. According to the data from the physician I. I. Yukolis, it possesses a powerful bactericidal, epithelializing, anti-inflammatory, adsorbing, and deodorizing action. "Natural cedar resin (turpentine-balsam) has a great therapeutic effect in the treatment of chronic ulcers of the shin of different origins (varicose, trophic, pustular), in purulent diseases of the skin and as an epithelializing agent in various ulcerous and erosive processes of differing etiology." During the Great Fatherland War (World War II), cedar resin was used to produce turpentine-balsam (purified and strained resin, the balsam is first dissolved, mixed with inert oils or vaseline, and a bandage is made), which was successfully used in military hospitals. It contributed to shortening the periods of hospital treatment for injured soldiers, returned healthy warriors to the army, and saved the lives of many. Tampons soaked in cedar balsam helped doctors stop gangrene that had already begun, protected wounds from festering and infections. Folk medicine in its centuries-old practical work always used Cedar Resin (Pine Resin) with Bilberry. Cuts and wounds were covered with resin. The most serious and most chronic tissue injuries, up to gangrene, were treated using cedar resin. It was applied to abscesses as a softening, extracting, and healing remedy. In fractures, the area of the injury was rubbed with resin - and the bone knit more quickly. Resin was used in the treatment of purulent wounds, boils, and burns. In contrast to resins of other coniferous species, cedar resin does not crystallize for a long time, and does not lose its bactericidal qualities. 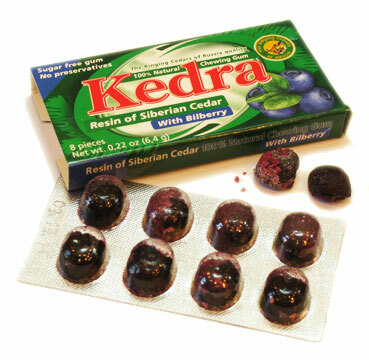 In Siberia, cedar resin was once used to treat toothaches by applying it to the teeth and gums. Sometimes fairly strange methods of treating the teeth were used. To illustrate, an enormous cedar grows on the territory of Sozursky, one of the monasteries of Arkhangelsk Oblast. Its bark is badly damaged. It is said that believers who suffered from diseases of the teeth gnawed the trunk of this cedar. There was a legend that, by touching the resin escaping from the cedar with one's teeth, a person could be cured from diseases of the teeth and gums, would get rid of a toothache. Local people also used Cedar Resin internaly - in ulcers of the stomach and duodenum, pulmonary tuberculosis, and pneumonia. The literature contains information how Russian healers used resin for treating cancer. Cedar resin is of very high-quality, it contains approximately 30% turpentine and 70% rosin. The turpentine (essential oil, turpentine oil) obtained from Cedar Resin (Pine Resin) with Bilberry contains 80% pinenes, which are the source material for the synthesis of camphor - a remarkable substance that stimulates the activity of the respiratory and cardiovascular systems. Camphor is used in the treatment of diseases of the nervous system and schizophrenia, it is a constituent of many modern medical preparations, including those that stimulate nervous activity. Turpentine finds an even wider application, especially in folk medicine. It is used in massages in cases of rheumatism, gout, neuralgia, catarrhal diseases of the respiratory organs, in the treatment of wounds, and in a number of other cases. Turpentine baths are prescribed by Russian doctor Zalmanov for the purpose of removing salts from the joints in cases of arthritis and polyarthritis; inhalations with the addition of turpentine to water are indicated in cases of putrid bronchitis. Heel spurs may be treated using local turpentine baths, in this case contrasting baths are alternated: cold-hot. After the end of the procedure, a compress from the boiled broth of the needles is placed on the heel spur for the night. In diseases of the respiratory organs, it is good to inhale the vapor of cedar resin that is burning slowly on coals. In the old days, cedar resin was gathered when it flowed out of a trunk or branches that had been damaged naturally. It was precisely this turpentine that was considered to be the most medicinal, the healer himself did not cause any harm to the tree. Cedar possesses a very high capability of healing its wounds by itself. According to the reports of cedar researchers, in circumstances of tapping, the wound becomes overgrown with wood beginning with the first year of tapping. With time, the wounds are completely overgrown as well along the entire periphery, and the trees do not differ outwardly from those that have not been tapped. The first stocks of Cedar Resin (Pine Resin) were kept in Gorny Altai beginning in 1932. In Tomsk Oblast the first production area was laid out in 1947, and already a year later forest holdings for the extraction of resin began to be created. From 40 to 60 kg of resin may be obtained from a hectare of cedar forest yearly. In the opinion of scientists and according to their observations of many years, tapping does not harm the cedars. On the contrary, it quickens the growth of the needles and increases the leafiness of the shoots. As a result of tapping, the cedar begins to accumulate in its crown the nutrients that ensure normal fruit bearing. However, researchers also associate a negative fact with tapping: the quantity of full-sized seeds decreases. Resin also finds use in industry. Thus, immersion oil is obtained from it, essential for special microscope technology, which helps to determine the refractive indices of the smallest particles of a substance. Cedar balsam is used in the optical industry. It is used to produce abietic acid, glycerin esters, and plasticizers.